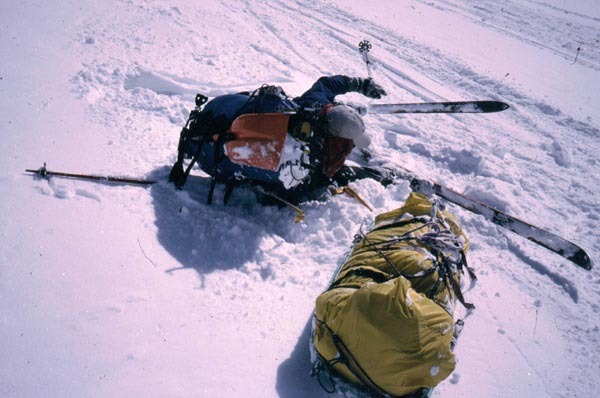 I should clarify that a dangerous avalanche forecast doesn’t mean all travel is dangerous. It means that route finding and terrain assessment have more importance, often manifesting itself in heart-breaking detours and much longer days. That said we have opted to delay our start by about a week to let the recent 18” of snow settle into more friendly stability. Zach and Fritz took the opportunity to solidify their bag of ski aerials. As of last week the double was being landed regularly but they were still having trouble sticking it with 50 lbs packs. Good thing we dumped the sleds! I’m going to use the extra week to make a few modifications on my gear and to dial my camping and ski systems in. Water is always a challenge in cold weather. Hydration reservoirs are super in non-freezing conditions but liter bottles in insulated ‘holsters’ are the best for extended winter travel. My first project will be a gizmo that attaches an insulated bottle holder and camera/ GPS case to each side of my Quantum Pack waist belt. The bottle will fit far enough back that it won’t interfere with my skiing and the camera will be ready for quick deployment. The weather looks better for now but the forecast could bring more of the same…. Our present thinking is a delay could help with conditions but things probably won’t get worse. Don’t wait to enjoy the good things of each day and be thankful for the opportunity to work hard. It looks like we will be skiing with a crew of 4 this year. Fritz, Zack, James and myself. 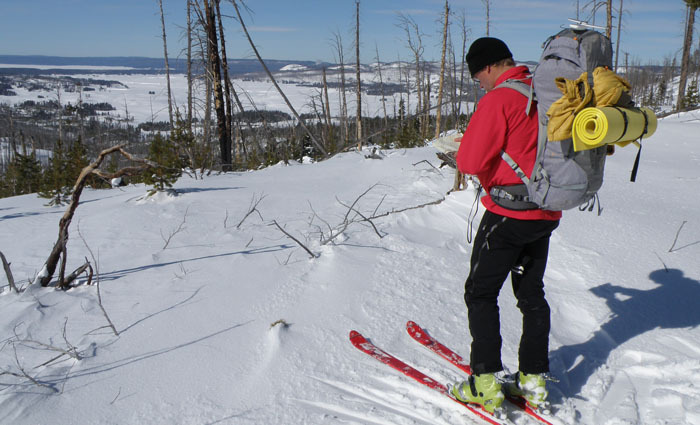 James and I go back to Montana – before Hyalite was the ice mecca it is today. Zack and Fritz are frends and co-workers of James. I’m not certain about Zack but the rest of us have, or do, make our living sitting behind a sewing machine. More than just post-modern sweatshop operator new age sensitive males, we have pieced together a lifestyle that balances a good amount of recreation with a decent living. Zach Holtzman – Zach has lead a life dedicated to skiing in two colors – black and red. When not long-boarding through Boulder, he designs t-shirts and sells gear at the local mountain shop. He claims to have been James’s protege in the Collegiate Range but I have yet to see him cook. Having the youngest knees in the crew I have high hopes to see him in the front often. 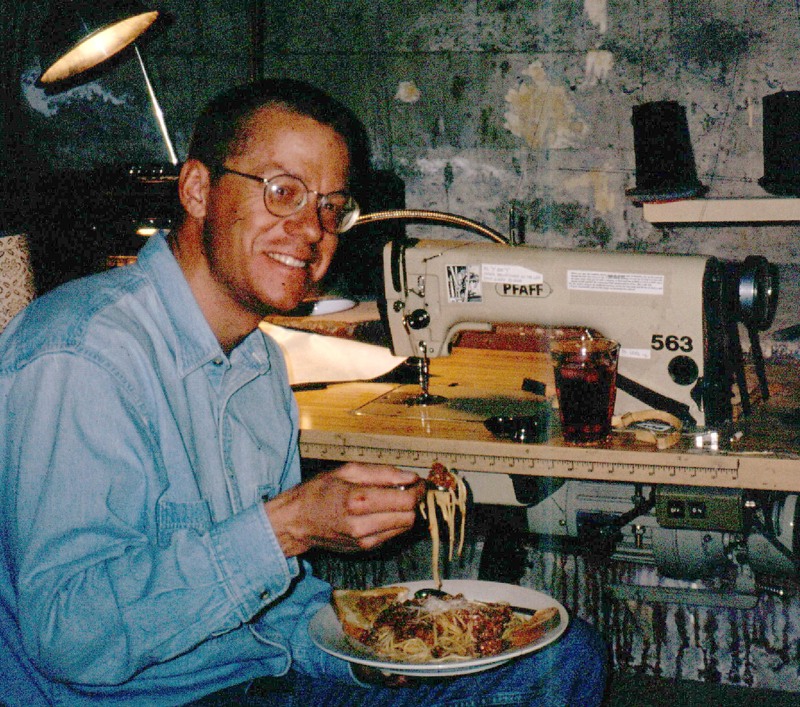 I think he may have a tough time hanging with the rest of us when we talk sewing. This traverse was Zach’s idea…. Fritz Howard – Fritz is the tallest. He also is an accomplished dog sled, ski jouring athlete. We may have to have an arm wrestling showdown on this claim but he has the most experience in these hills. 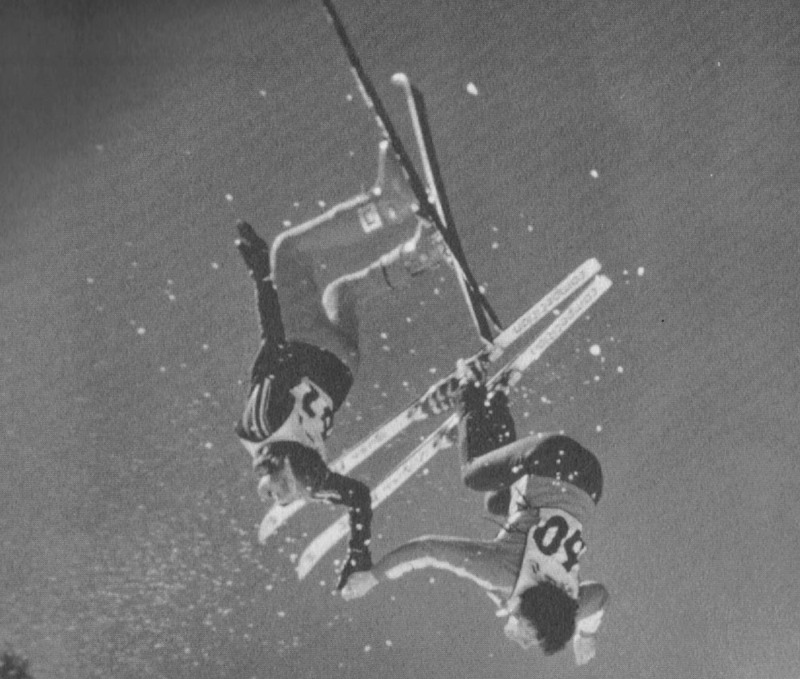 He posesses a unique level of skiing that comes from years of being pulled behind strong/ fast sled dogs – maybe best likened to turbo water skiing meets nordic skiing, without the exhaust. When not running his dogs through the mountains around Leadville, he runs his own outdoor clothing company – Melanzana – http://www.melanzana.com . James Healy – James is so gungho on skiing lack of snow doesn’t faze him. 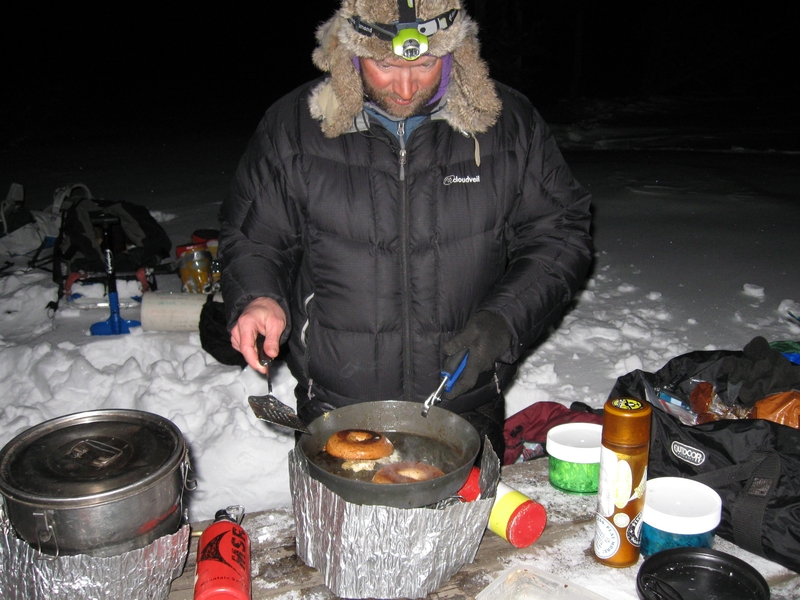 In addition to his great backcountry cooking skills he has a cool little company that makes padded covers for crutches – Crutch Buddies – http://www.crutchbuddies.com/ . He’s living in Michigan now and has recently discovered kite skiing. Watch out! Skiing skills + sewing skills + big frozen lakes + wind…..
David Schipper – I’m fortunate to have this crew to ski with me! When I’m not carrying small packs through easy terrain I run an outdoor gear design/development company out of sunny Moab, UT – Outdoor Labs – http://www.outdoorlabs.com/ . It’s a puzzler to be gearing up for a winter trip in flip flops and shorts. 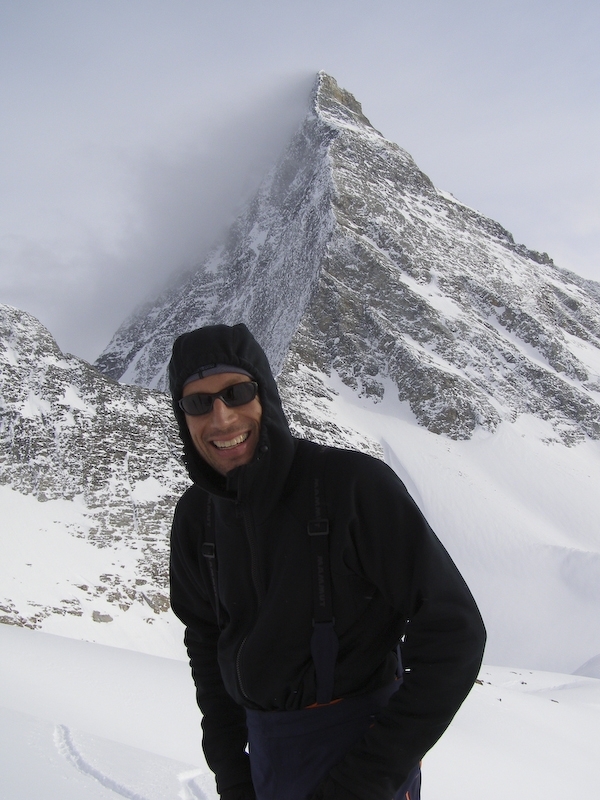 In addition to our skiing crew, Trey Cook, my long time climbing and skiing partner will be managing all of our live updates through his social marketing portal in Chamonix, France. We’ll email text and photos to him and he will load it into blog form. He has a great blog out of Cham – http://chamonixinsider.com/ . Sweet skis Trey – Remember when you couldn’t ski!! Each day is a gift. Be kind to one more person than usual and take a minute to try to understand a view other than your own. Enjoy the weather and smile. 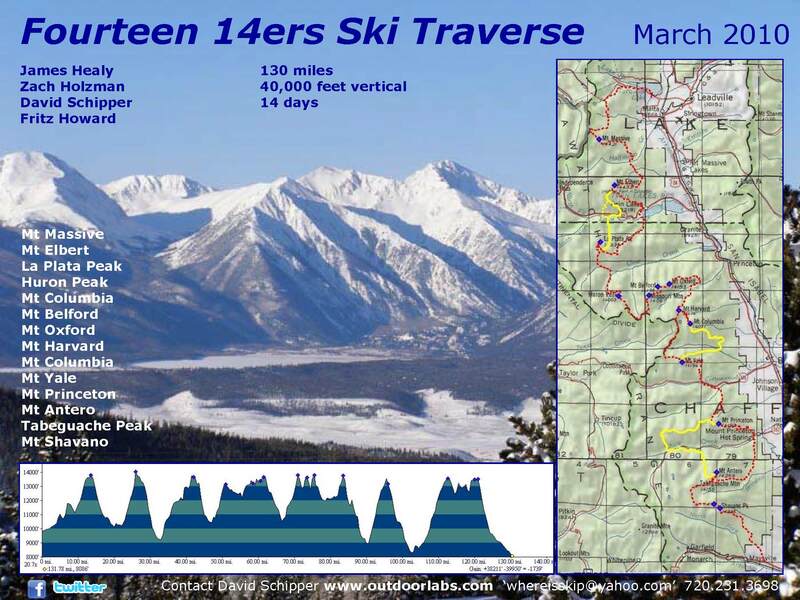 Fourteen 14ers – What Gear and Why? This blog is an open format on finalizing our gear. 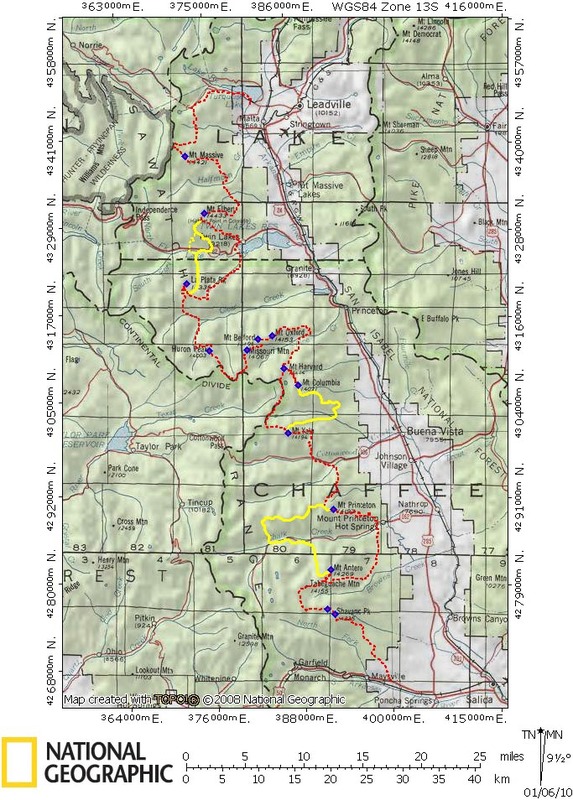 We know National Geographic MAPS software estimates 130 miles, 40k’ of climbing and 41K’ of descent, and we will cross fourteeen Colorado 14,000′ peaks. It also looks like Zach has 2 weeks off, and we may have 3-4 options for caches, and I really can’t ski (with more than 60lbs in my pack). At this time we expect to start skiing on March 28th, 2010, with hopes of completing it in 2 weeks. A lot of gear decisions are predicated on the feasibility of 3-4 supply caches. Theoretically meaning we will be able to carry as little as 10-15 lbs of food and fuel between resupplies. 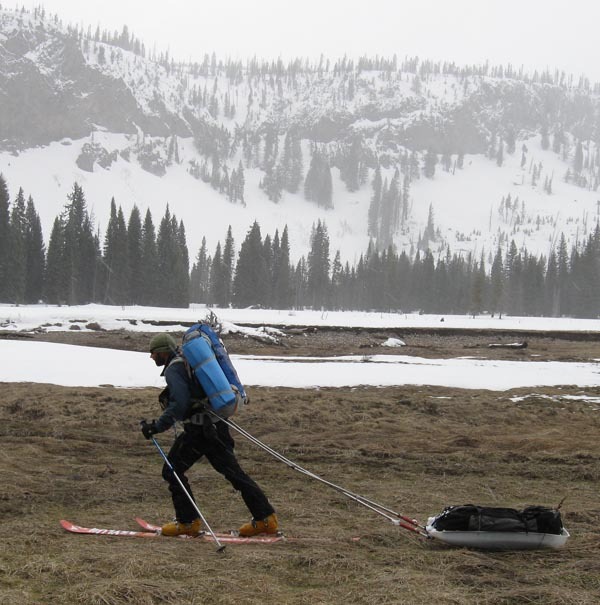 Pulling a sled worked well last year skiing across Yellowstone. As well as it could… This trip promises varied snow conditions, scoured ridge lines, bare rock and lots of cross-fall line traversing. I think we should skip sleds and focus on more caches. Fritz and James, you will have to estimate whether the caches will work. I just sent James his box of goodies, the same as I dropped off with Fritz and Zach. Check out the gear, mark it and make sure it flies. I’d like to ask you to load the National geographic MAPS software http://shop.nationalgeographic.com/ngs/product/maps/mapping-software/colorado-14ers-explorer of the area so we can have a conference Skype this Friday. Once your software is loaded I can send you a file of the drafted route and we can look at it more closely. Once we have narrowed down our best route guess I will drop in a bread crumb trail of waypoint. I’ll print two copies of maybe 10 pages of detailed maps with our route, alternate options and waypoints. NGMaps scored us some waterproof ‘Adventure Paper’ – I’ll put the map on one side and waypoints on the back. Will Friday work for everyone? How about 6:00 PM? Easton supplied two Si2 Tents with super light carbon poles http://eastonmountainproducts.com/tent/si2-tent. These are very tight, even with the vestibule. Make sure you sleep in them once or twice, ideally in the snow. The vestibule helps but it will be compact. I have about 8 nights in the one in Moab and I’m in. I would like to avoid buying a synthetic sleeping bag and really like my down jackets and pants. Last year in Yellowstone James and I got really wet near the end and it could have been a bummer if the trip stretched into two weeks. What do you guys think? Sleeping pad is foam full length and 3/4” Thermarest-type pad too?!? I have a Black Diamond Quantum 65L pack http://www.blackdiamondequipment.com/en-us/shop/mountain/packs/quantum-65 . I’m fabricating an additional pocket for the back. If we have caches I’m hoping for less than 55lbs total pack weight at a time. Skis – mine are a bit narrow Movement Red Apples with Dynafit bindings. I think I will run without brakes or leashes – is that too risky? Easton also provided each of us 3 section carbon poles ttp://eastonmountainproducts.com/trekking/ctr-60 . I have a spare bottom section and extra cam locks. I was out last weekend in the LaSals and my skins were very prone (3 yrs old) to caking with snow. We’ll need lots of skin wax and I think I will get a new pair for this trip – mine are looking hairy. SCARPA outfitted me with a pair of their new Mistraeli 4 buckle lightweight boots so I have an extra pair of SCARPA f1s(28s) http://www.backcountry.com/outdoorgear/Scarpa-F1-Race-Alpine-Touring-Boot/SCR0092M.html and the thingy that goes on on the binding for the bellows. Axes, crampons and rope?? My vote is crampons if anything. I have a bunch of 60-100′ 8mm rope scraps we could use. Smith has provided a Maze Helmet www.backcountry.com/store/group/39/b87/Smith-Helmets and I/O Goggles for each of us. The helmets are lightweight and carry nicely with goggles inside when not needed. How many shovels and probes? I have a Tracker avy beacon. Any idea how many batteries will be needed for 2 weeks? GSI Outdoors provided a great cook set – PINNACLE BASE CAMPER ( http://www.gsioutdoors.com/detail.aspx?c=4&sc2=57&p=50175&lu=%2flist.aspx%3fc%3d4%26sc2%3d57 ). It has two big pots, a fry pan and spatula. We may need a bigger fry pan and spatula to handle all James’s skills. I have 2 older MSR Whisperlite Stoves and enough spare parts to keep them going until the 22nd century. James, will you make the call on what you want me to bring for stoves. Do we need to make new super-light weight PBR stove platforms? I’m bringing one digital camera, a phone camera, GPS and binos. I’m not sure how much we need to double up on GPS, binos and phones but if one of you have a camera phone with internet capabilities it would be good to have a back up. I have a Brunton 12v solar panel that will afix to my pack to charge anything that has a cigarette lighter charger. 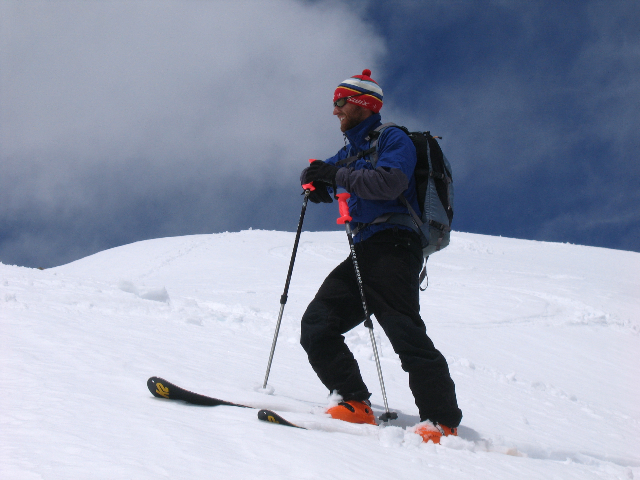 At the end of March we’ll start a ski traverse across fourteen of Colorado’s ’14er’ peaks. 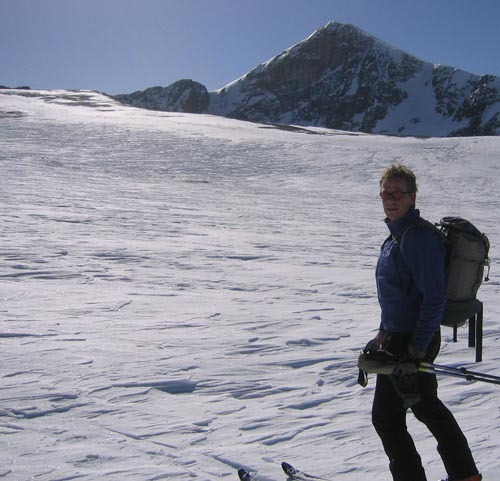 Our team of four will ski from Monarch Pass to Turquoise Lake. Using National Geographic TOPO mapping software, the stats look like 130 miles, 40,000′ of vertical climbing, and the option for 3 ration caches. I’ve stacked the deck with James Healy as a cook extrordinaire, Fritz Howard as ‘knower’ of local terrain and Zach Holtzman as master trail breaker. Actually those skills are just the additional gems they bring to the trip. 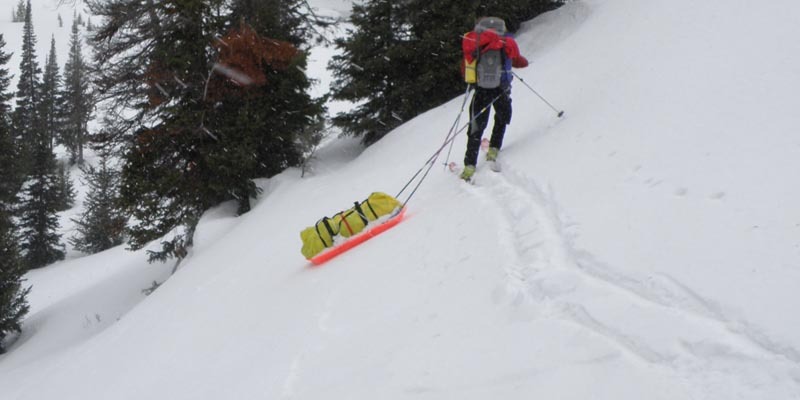 Each of them skis face shots or crust with a fifty pound pack, navigates safely through avalanche terrain , and is comfortable in a tent for weeks. 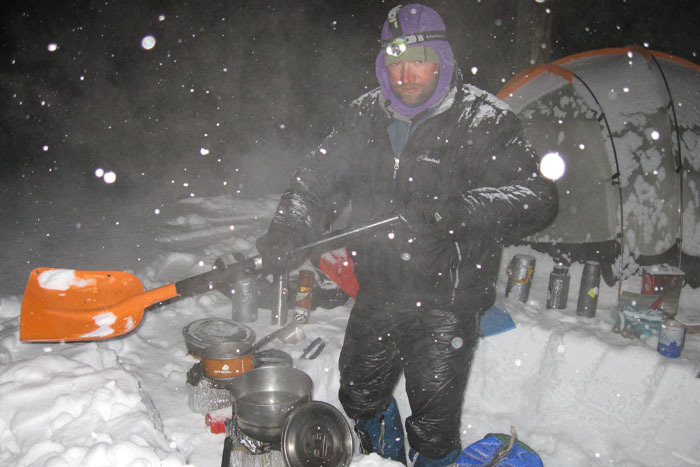 For years I considered winter camping food preparation as much fun as scraping ice off the bottom of my skis – important, but bothersome. 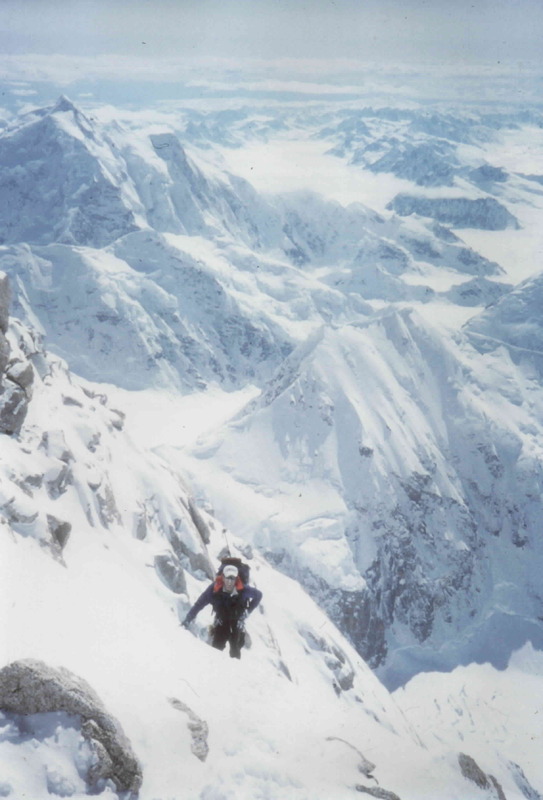 In 2000 James and I were on Denali with my regular climbing partner Trey Cook. We started our rotation of cooking with Trey, then me, and followed up with James. Before James served his first meal Trey and I knew we were out of our league, and very happy about the realization. Our camp chores were quickly rearranged so James cooked and Trey and I did everything else! Six days later James led the steep section through the upper West Rib to the summit… proving himself ‘multi-faceted’. We opted out of pulling sleds because they prove to be cumbersome traversing side hills and ridges. Consequently we are uber-weight conscious and will need to use ration caches along the way. James will organize all food and fuel needs, buy it, and remove weighty packaging and re-package it for the trip. He’ll then work with Fritz to place cache sites on the route. James has useful rules of thumb for allocating food and fuel and their weighty consequences, explained below. Crunched a little ration plan and if we are able to re-ration every 4 days or less, total weight for food and fuel should not exceed 12 lbs each (10 food + 2 fuel – 1 liter). Extras (personal treats, energy bars, bourbon) would add more. If we went 6 days without a re-ration, total weight would go up to about 16.5 lbs ea. Ration is based on winter, which is usually about 2.5 lbs of food per person per day in order to get enough calories. If we are really concerned about traveling ultralight, we could shave it down to 2.25 lbs, which would save us about 1 lb each for 4 days. Fuel is generally about 1/2 liter/stove/day. We will have 2 stoves, so about 1 liter of fuel each day, depending on how much snow we are melting for water. We can bring iodine or a filter and fill up from streams if available. Total ration weight for 13 days is 130 lbs at 2.5lbs/p/d before treats. Will pull together the plan and have everyone review it so no foods are forgotten and distasteful items are eliminated. Any thoughts on route going from North to South or South to North? Looking at likely re-rations and dates.